The Taiga ecosystem is located in the northern hemisphere close to the Arctic region. This very cold forest stretches across the northern sections of North America, Europe, and Asia. Large cities, like Moscow and Toronto, are in the southern part of this ecosystem, but the area that is farther north is relatively unpopulated. Some animals that live in the Taiga never see a human being. The Taiga is a very large forest ecosystem. It contains about 25 percent of all the trees in the world. It covers 17 percent of the earth's surface. Most of the Taiga in North America was once covered with glaciers that have gone away, leaving carved out areas in the land. These depressions are frequently filled with water, creating marshes and lakes. The word Taiga is from the Russian language. It means "Marshy forest." 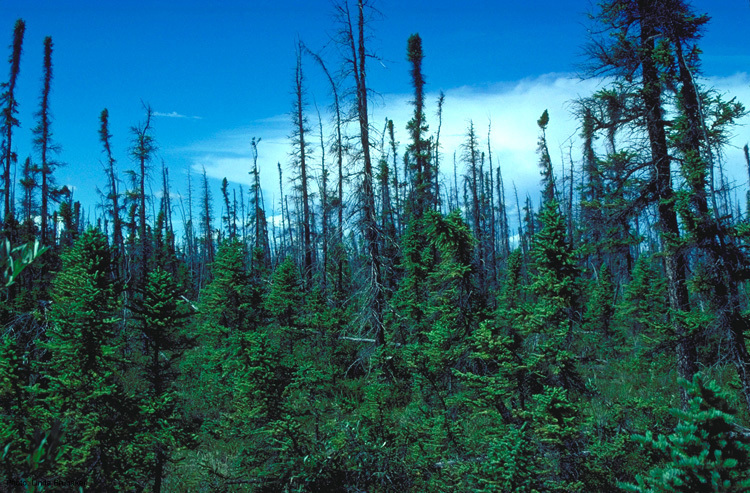 The soil found in the Taiga is low in nutrients and high in acid. The acid in the soil comes from the pine and spruce needles that are very acidic. The soil is rocky and thin. Because the region is so cold, the vegetation doesn't decay quickly. Wet, undecomposed vegetation sits on the soil like a sponge. Also moss grows on top of the soil and there is a lot of lichen as well. The soil lacks nutrients and there is little sunlight. So, the trees don't grow quickly. The tree roots don't go very deep, so the trees never grow very tall like the forests farther south. Trees grow taller where warmer temperatures allow for faster decomposition of vegetable matter or by streams and rivers which carry nutrients from higher ground. The trees in the Taiga are mostly coniferous trees such as pines, fir, and spruce. "Coniferous" means cone-bearing. These trees are also called "evergreen" because they don't lose their needles. The dark green color of the trees allows them to absorb more of the little sunlight that's available. The branches of many of the trees slope downwards so that the snow will more easily drop off of them. The forest also contains some deciduous species such as larch, birch and willow. Deciduous trees have leaves that drop off in the autumn and grow again in the spring. There is a wide range of temperatures between winter and summer seasons. Winters are long and cold, and the summers are short and cool. Summer lasts only about three months of the year. In the summer, the days are very long. Precipitation is fairly low throughout the year but snow is frequent during the winter months. During the summer months, the Taiga fills up with millions of insects. Birds, who eat insects, migrate every year for the insect feast. The cold climate of the Taiga prevents many animals from living there year-round. 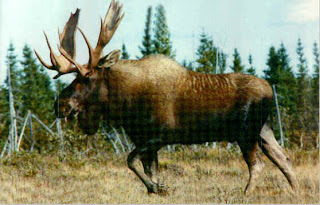 Some of the large animals found in the Taiga include moose, deer, and bears. Examples of smaller animals that live in the taiga are bobcats, squirrels, chipmunks, ermine, and moles. During the bitterly cold winters, some animals migrate south while others, such as the brown bear, hibernate. Birds have adapted to the extreme cold temperatures by producing a layer of insulating feathers. Animals such as the ermine or the wolverine have thick fur to protect them from the cold. The ermine also can change color. Its dark brown summer coat changes to white in the winter. This change in fur color helps the ermine blend into its surroundings and makes it more difficult for predators to see them. 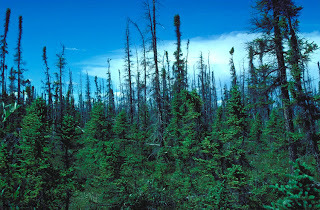 The Taiga is prone to wildfires. Many trees have adapted to this by growing thick bark, which can protect a tree from a wild fire. But these natural fires are good for the forest. The trees depend on the forest fires to release the seeds in their cones. One interesting bird living in the Taiga is the waxwing. The name "waxwing" comes from the drop-shaped and waxlike tips of the secondary wing feathers. These feathers have long shafts, and the wax-like appearance is actually the tip of the feather's shaft. The sexes look much alike, except that the female's plumage is duller. Waxwings usually live on fruit and berries, but they will catch insects during the breeding season. In winter they sometimes migrate south of their range. During his courtship display, the male presents the female with a berry or ant egg, which the birds then pass back and forth from beak to beak but never swallow. The bulky nest is made from twigs, moss and plant fibers, mainly by the female, who lays 3 to 7 eggs, She sits on the eggs, but when the chicks are born, the father helps her to raise them. The wolverine is another animal living in the Taiga. It is actually a weasel. It is the size of a small bear or a middle sized dog, but it is very muscular, powerful, and ferocious. It can catch and kill prey much larger than itself. It can move easily through the snow with its large five toed paws. The thick oily fur of the wolverine naturally repels water so the animal can resist frost and snow. For this reason, many trappers catch wolverines and use their fur to make water-resistant jackets. Because so many wolverines have been killed, their numbers are much less now than before. They are almost extinct in the southern part of their range. 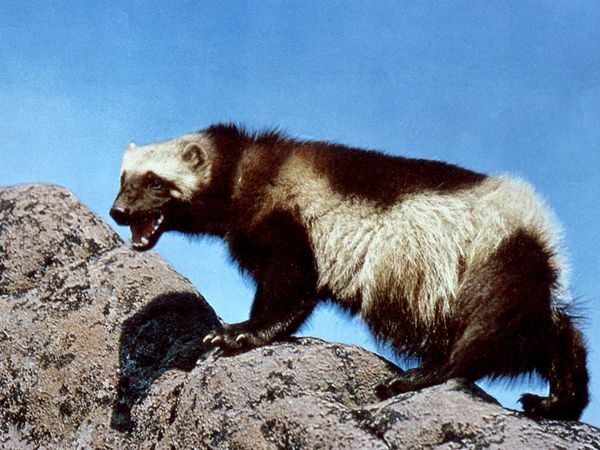 The wolverine, an expert scavenger, will often feed on the left-overs of a dead animal that has already been killed and eaten. The ferocious energy it displays when ripping at the flesh of an animal has earned it the reputation of being a glutton. One of the prey animals for the wolverine is the moose. The moose is in the deer family. Moose are solitary animals. They don't belong to herds. Although generally slow-moving and sedentary, they can become aggressive and move very fast if they are angry or afraid. Their mating season is in the autumn. Moose battles can be very violent because males will compete for the right to mate with a particular female. Moose are one of the few species that can feed on pine and spruce needles. They also eat the lichen, twigs, and bark. Their stomach has four separate chambers and contains micro organisms that break down food efficiently. Moose don't move very much, but if they have to run, they are fast. They can run 35 miles per hour! They can swim 6 miles per hour. So they can probably escape a wolverine who is chasing them. The wolverine usually can't catch a moose unless the moose is sick or wounded. 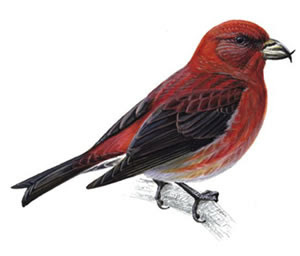 Another efficient eater in the Taiga is the crossbill. This bird has a funny beak. The top part of the beak curves in one direction, the lower part curves in the opposite direction. This strange beak allows the crossbill to twist a pine cone apart so that it can reach the seed inside the cone with its tongue. The tree likes the crossbill because seeds that the crossbill doesn't eat fall on the ground and slowly begin to grow another tree in the thin soil. The Canadian lynx is another lonely animal in the Taiga forest. The name "lynx" comes from a Greek word that means "light". This animal is named for the brightness of its eyes. Also, it has thick fur as a defense against the cold. It has wide padded feet it uses to roam across vast snow fields in search of prey. The lynx sometimes covers thirty miles in one day searching for food. The main prey animal for the lynx is the snowshoe rabbit. 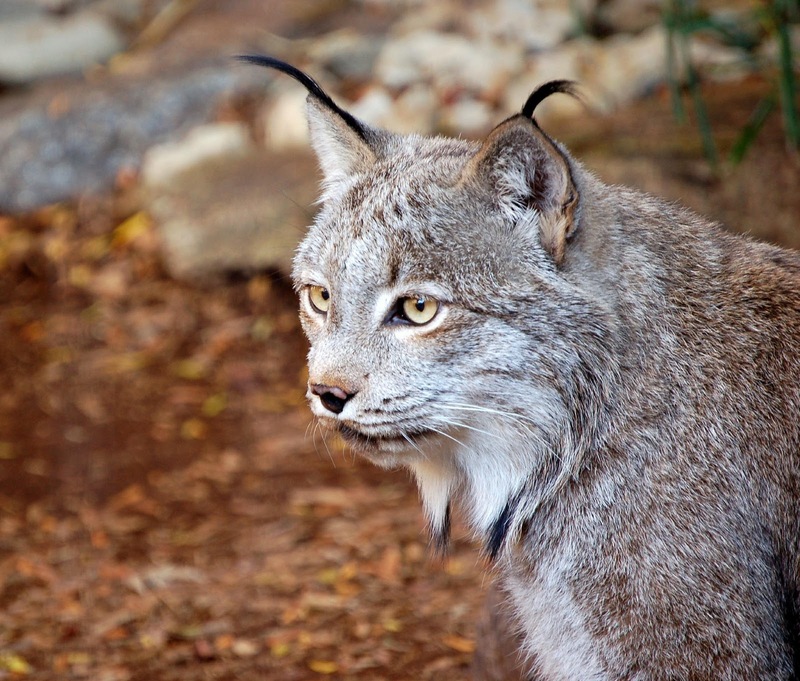 If the snowshoe rabbit is in short supply, the lynx will hunt other mammals and birds. When there are a lot of prey animals, the lynx population will increase. But if there is a big shortage, the female lynx will refuse to mate. For years, Russia protected its vast forests, but now they are using the Taiga to make money from the lumber industry. Unfortunately, most lumber companies practice clear cutting, a cheaper way to harvest trees. Clear cutting disturbs the soil causing erosion and pollution of rivers. Destruction of the soil limits the potential for planting new trees. Lumber companies are not only exploiting Russia, but they are also cutting down Taiga forests in Canada. Only 8% of the taiga in Canada is protected, but 50% has been allowed to be harvested by the government. There are many reasons for deforestation of the taiga. Most reasons are the usual reasons (paper, lumber, etc). Another threat is the gathering of fossil fuels. Since people are so desperate for petroleum, they will go anywhere to get it including the taiga forest. What can we do to help preserve the Taiga? Whatever country we live in, we should join or support organizations that resist the exploitation of the Taiga and other forests by lumber companies and oil companies. The future of our planet may depend on our collective efforts. 1. The crossbill uses its unique beak to _____________________ . 2. The following American and/or international organization does not oppose exploitation of the Taiga: ________________ . 3. The wolverine is known as a glutton. In other words, the wolverine ___________________. 4. 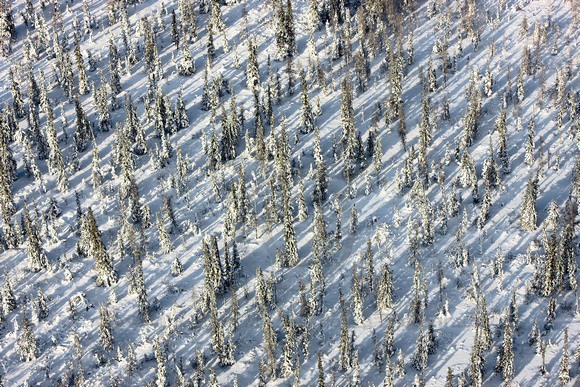 The Taiga contains _______________ percent of the world's trees. 5. Two countries that permit lumber companies to clear cut Taiga forests are: _______________________ . 6. Forests prevent global warming because they _______________________ . 7. The state of ___________________ has more Taiga forest than any other state in the United States. 8. During bitter cold winters in the Taiga, some animals hibernate including _______________________ . 9. A female lynx will not mate if __________________________ . 10. The moose is a prey animal for the wolverine, but the moose usually escapes unless ________________________ .